"My wife and I did a lot of comparison shopping before settling on Sportsmobile. One big reason was we could get what we wanted in the way of a floor plan, colors, and options. We did not have to pay for things we didn't need or want." Slide open the door and step in. The interior is quite attractive, with a clean uncluttered look. The third Captains seat is removable from the inside of the van. There’s nothing to unbolt underneath the van. The galley is functional and compact. It includes a sink, 3CF refrigerator, water heater, and an induction 100V cook top. The tall cabinet has a Porta Potti, microwave and Danhard A/C. 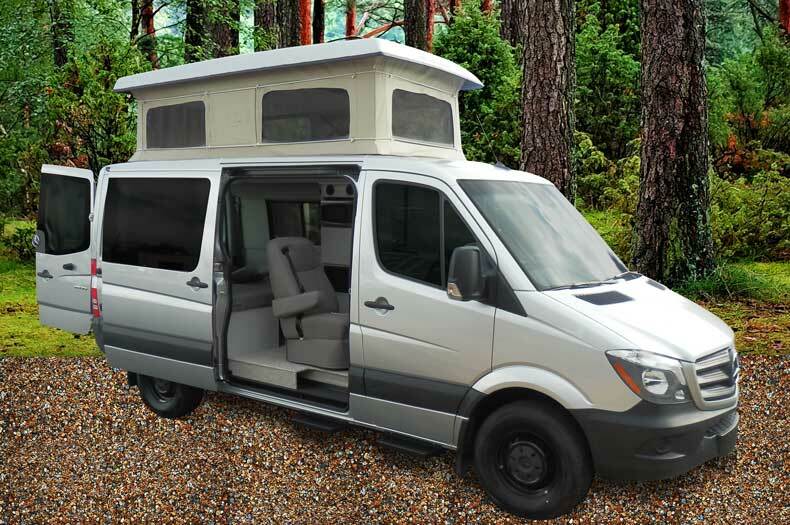 The van’s rear has an exterior shower, fresh water tank, 2000W inverter, and extra batteries. Couch seats 3. A table is standard. Convert the couch into a bed in a minute. For a really big bed, place the bolster back cushions between the seats.